A not bad start for the season that was being snorted at by the British press. In fact, it’s a brilliant start with more snow in the mountains than at any point of last winter – that’s nearly 2 metres at Lognan and 3.25 metres at the top of the Bochard gondola. Despite the good news, most of the mountain’s been closed this week due to…..too much snow! Well it does happen, and often it results in avalanches. Ski prudently when it does all open up. 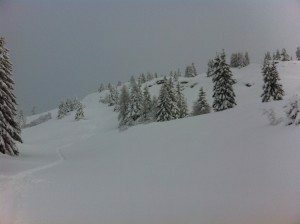 So, this week, Powderama’s been down at Les Houches (4kms away from Chamonix) testing out the pistes and the depth of snow between the trees. All is good with no damage to the ski bases! So, told you so, all would be ok for the Christmas holidays.